Trust us when we say you get around quicker and see allot more on a rental bike. Its the best way to reach your destination and explore Allgäu with its magical and enchanting sceneries by bike. Don't let the bus timetables or queues hold you back when you can just hop on a bike and be on your way - It's great fun. The time you waist waiting around will have taking in some of the most memorable attractions. 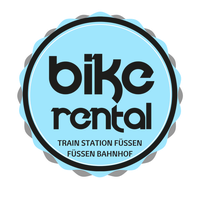 Our Bike Rental is centrally located, we are inside Füssen Central Train Station. The only difference between our bikes and those of most locals is that our bikes are in perfect working condition. We have top quality bicycles for hire - E-Bikes, Mountain, City and Children Bikes. In addition, we also have a unique shop that offers refreshments, Milkshakes, Drinks, Iced Tea and Iced Coffee. We also specialize in local souvenirs that will be memorable for years to come. Should you wish to cycle the evening and watch the sunset over the enchanting sceneries of our Castles, Lakes and Mountains. You can drop your bike back to our drop off point in the Train Station Füssen, Lock your bike and put your key into our safe box. SO Easy. The International Ticket & Travel Center is opposite to our Bike Rental and offers Skip-The-Line Tickets to the local attractions and sights. By booking or buying your tickets this way, will save you a lot of time queueing at the most visited sights like the Neuschwanstein and Hohenschwangau castles. The Train station have lockers in the centre of the train station should you need to store luggage, prices depend on what size locker you need quite cheap for 12 hours.